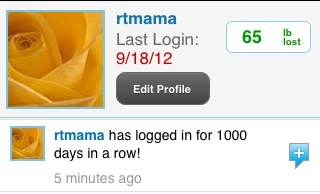 Yesterday was my 1000th login day at MyFitnessPal and a friend asked me for my top 3 tips from my journey. I took a little time to think about it, and here they are. Eat whole, unprocessed foods. If you are truly hungry, eat, even if it means going over your calories a little bit every once in awhile (as long as you are eating healthy whole foods.) No need for “fads”, like eating every 2 hours or not after 6pm. Listen to your body and eat when you feel it’s right. Treat yourself every once in awhile. Don’t call it a “cheat”, it’s a treat to reward yourself for a job well done. When treating, make sure to choose something really worth the calories, not some crappy Oreo cookie. Treat yourself to a piece of chocolate cake or dinner at your favorite chain restaurant. And LOG LOG LOG. Don’t hide your choices, always log! Soul Search to figure out what made you overweight in the first place. It’s a long process, and you might not ever be “cured” but once you understand what’s inside your brain, you can learn to live with it. It might feel scary to keep your food diary “open” to your friends, but it will force you to be accountable for your actions, and that is a good thing. Don’t ever be ashamed of your food choices, just strive to get better. Remember that nothing happens overnight. Food choices don’t magically become healthy in one week; it might take months before you transition to whole foods. Baby steps! You are in this for the long haul, not for a quick fix! it’s a lifestyle not a diet! I’m so behind on my gardening updates. I’ve been shooting a lot of photos, but I just don’t have the time to update the blog! But I wanted to mention another fascinating bit of nature. Back about a month ago, I was in my garden in the morning, and I was pleasantly surprised to see a teenie tiny frog (or is he a toad?) 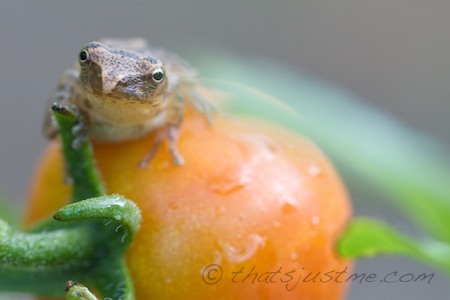 sitting atop of one of my cherry tomatoes. He was mid-plant, about 2-3 feet up. I immediately rushed inside to get my camera, and snapped a bunch of photos of his cuteness. Look, can you see him? He’s in the middle of the photo, on a tomato. He was so tiny! Here is a close up. 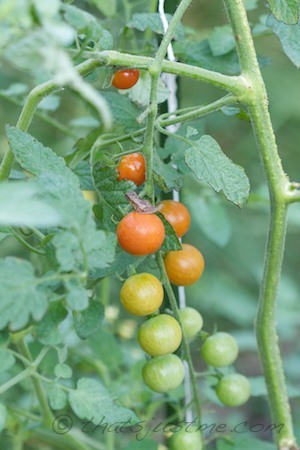 You can see his tiny fingers grasping onto the tomato stem. So freakin’ cute! I love my garden! There’s always something new to discover. It’s sad that summer is fading, and so is my lovely garden. Even though I’ve grown a few veggies in prior years, this was truly the first year that I was serious about gardening. The first year is always a bit special, but I hope I always feel the same appreciation and respect for what’s growing out there EVERY season. I know subsequent seasons probably won’t feel as “wondrous” as this year, and that makes me sad too. Haha! I know autumn is coming because my jar of coconut butter is starting to slightly solidify! I love summer and I really don’t want it to end, but there is something about the crispness of autumn that I really enjoy! I’m excited for apples, pears, carrots and butternut squash. I am looking forward to warm nights by the wood stove. I’m also looking forward to cooking up some yummy soups for dinner. Author debbie @ That's Just MePosted on September 5, 2012 Categories FoodTags Autumn, Coconut oil, FOOD, healthyLeave a comment on Autumn is on the Way!